In the Jesuit tradition, St. Francis Xavier School sees spiritual formation as integrally connected to the academic, social, emotional, and physical development of the whole child. Through Campus Ministry we provide opportunities and activities that enable our students to respond to the invitation of St. Ignatius Loyola to find God in all things, live for the greater glory of God, and seek the magis as they become young men and women for others. In order to fulfill its mission of caring for the soul and faith life of our school community, Campus Ministry facilitates the following: liturgical services, retreats, sacrament preparation, formation and service opportunities. The St. Francis Xavier School Christian Service plan is tied to our student learning objectives and the Jesuit philosophy of serving the poor and the needy. Voluntary school wide service projects and classroom service projects help our students to be “Kids for Others.” Seventh and eighth grade students participate in the Arrupe Project. Weekly Mass is held in either St. Francis Xavier Church or Brophy Chapel. Other liturgical celebrations include all-school Rosary, Stations of the Cross and Adoration of the Blessed Sacrament. Students in second grade prepare for and receive the sacrament of Reconciliation. Third grade students prepare for and receive the sacraments of First Eucharist and Confirmation. Both classes attend a retreat with their parents. Fr. George Wanser and Ms. Kim Cavnar with SFX students who received the Christian Service Award. 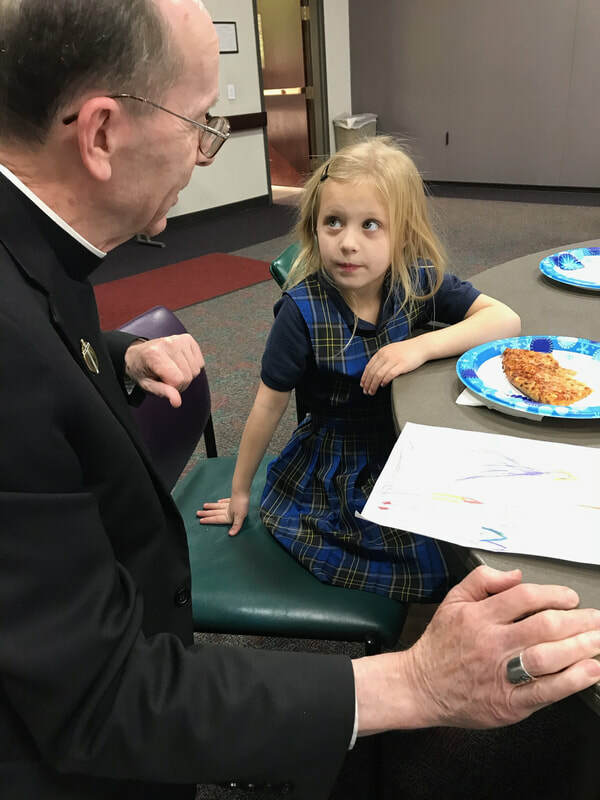 SFX Kindergarten student won the Rosary Poster Contest and was celebrated at a luncheon with our Bishop.